This morning we cooked sweet bell peppers with eggs over easy; a creative and tasty way to add vegetable nutrients to breakfast. Sweet bell red peppers are an excellent source of Vitamin C and a good source of Vitamin A. In the past we've made peppers and eggs using sweet banana frying peppers with scrambled Egg Beaters, this was something different. The idea was inspired from a recent Pinterest post. They weren't as picture perfect as the Pinterest post; the egg whites ran out a little from under the pepper rings, but it added interest to the creation. Everyone enjoyed them! Remember if you're growing bell peppers, let them ripen to yellow, red or orange for sweeter flavor and higher Vitamin C! Cover and cook until the whites are cooked. 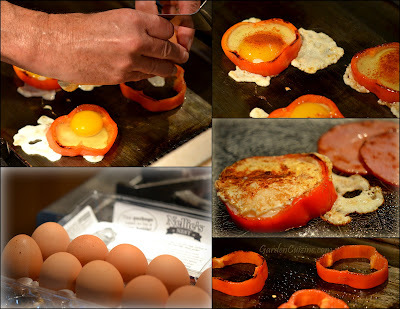 If you don't want to overcook the yolks, flip the egg in the pepper ring as you would for eggs over easy and serve. Blog post and photo collage Copyright (C)2012 Wind. All Rights Reserved.